Nahaha Lau: In 1939, a Shanghai entrepreneur Mr. Li Ying Sheng came to Hong Kong and established South China Brickworks in Castle Peak (Tuen Mun). It was later renamed Keen Sing Brickworks. Keen Sing Brickworks was located near the hill Por Lo Shan, which provided plenty of “red mud” as material for producing fired bricks. As the business evolved, the Brickworks hired pottery craftsmen from Shiwan Town of Foshan City in Guangdong Province to produce ceramic statues of Buddha and Guanyin, as well as Tang Sancai earthenware. These craftsmen contributed to the revival of the ceramic industry in Hong Kong. One of these craftsmen, Mr. Leung Sum, took over the nearby “Castle Peak Pottery Kiln” (a.k.a. “Dragon Kiln”) located in Hin Fat Lane off Castle Peak Road in 1951, and produced a variety of household ceramic items from there for years. “Castle Peak Pottery Kiln” is now a Grade 3 Historic Building as listed by Antiquities Advisory Board. As the competition in the ceramic industry within the region became intense, Mr. Li moved on to establish brickworks in Borneo. The original location of Keen Sing Brickwork was then turned into a residential area. 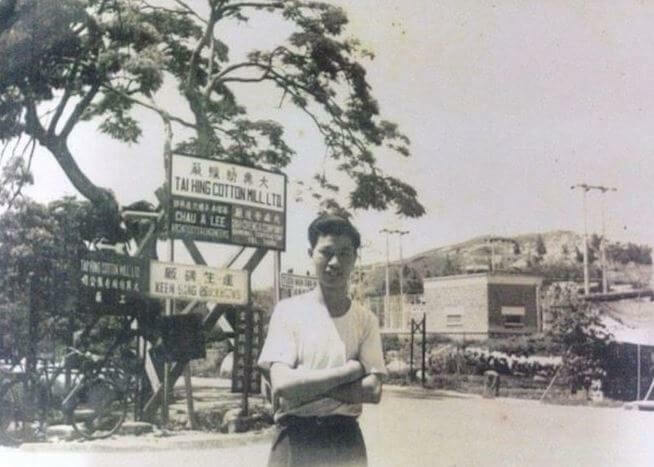 I have looked through the Tuen Mun Old Photos Facebook page and found an image regarding Keen Sing Brickworks. I contacted this page and we have been given permission to post this image by Mr Siu Chi Wah and Ms Nora Yeung, the original owners of the photos. The photo dated 1957, shows a road junction on Castle Peak road, with signs of different factories and arrows pointing to the left. One of the white factory signs says “Keen Sing Brickworks(? )” (Chinese: 建生磚廠). This article was first posted on 17th February 2016.